Sky Blue FC and the Washington Spirit played to a 0-0 draw at Yurcak Field in Piscataway, New Jersey on Friday night. While the rest of the league remains off for the international break, Sky Blue earned one point at home and remain in last place in the league standings with a 0-8-2 overall record (2 points). The Spirit, in second to last place in the standings, earned their third draw of the season and are now 2-7-3 (9 points). Sky Blue FC remains in pursuit of their first win of the season, second only to the 2013 Seattle Reign for the longest winless start to a season (11 games). The last time the two teams met it was the Spirit that outlasted Sky Blue Blue 1-0. This time around looked differently in personnel without several of typical starters due to international duty. Sky Blue were without six players: Janine Beckie (CAN), Adriana Leon (CAN), Carli Lloyd (USA), Savannah McCaskill (USA), Thaisa Moreno (BRA), Rebekah Stott (NZL) and the Spirit were without four: Yanara Aedo (CHI), Rose Lavelle (USA), Francisca Ordega (NGA), Rebecca Quinn (CAN). On Friday morning the Spirit announced that forward Mallory Pugh will be out for the next 8-10 weeks after suffering a posterior cruciate ligament (PCL) sprain in her right knee. The first half was a scramble on each side. Niether Sky Blue nor the Spirit could find the back of the net and both teams struggle to take control of the game. In the 12th minute, Spirit defender Whitney Church made a big step for her team and found midfielder Estefanía Banini down the flank. Banini did a cheeky inside-out move and shot far post. Her shot went high past Sky Blue goalkeeper Kailen Sheridan. The game was scoreless at the break with Sky Blue taking five shots with one on target and the Spirit recording four shots with two on target. The final 45 looked like a match featuring two teams in desperate need of three points. Sky Blue had two back-to-back chances with the first sparked by a nutmeg from forward Mackenzie Meehan. Meehan, after successfully nutmegging played it out wide to midfielder Madison Tiernan who was able to get the service off into the box. Katie Johnson was in a good position in the box but wasn’t able to put it away. In the 54th minute it looked like Sky Blue FC forward Shea Groom would get her team on the board. Groom was played into space by midfielder Sarah Killion and used her speed to beat the Spirit’s backline. Groom once she got herself to the touchline slotted it back to Johnson who was crashing but the pass went out of Johnson’s reach. Groom finished the game with six shots (two on target) and Johnson finished with three shots (one on target). In the 78th minute Banini drew a foul in the penalty area and midfielder Andi Sullivan stepped up to take the PK. Sullivan shot low right and Sheridan guessed right and made the save. The latter of the second half looked like Sky Blue would snap their winless streak, yet the Spirit’s backline in Estelle Johnson and goalkeeper Aubrey Bledsoe held their ground to come away with a point on the road. Johnson had a team-high eight clearances on the night and also made three interceptions and four blocks. Bledsoe had seven saves on the night. Sky Blue finished the game with 20 total shots to the Spirit’s 11, however the visitors had the better of the possession on the night with 55.3% to Sky Blue’s 46.3%. Match ends, Sky Blue 0, Washington Spirit 0. Second Half ends, Sky Blue 0, Washington Spirit 0. Attempt missed. McKenzie Meehan (Sky Blue) header from the centre of the box misses to the left. Assisted by Sarah Killion with a cross following a corner. Attempt missed. Shea Groom (Sky Blue) header from the centre of the box misses to the left. Assisted by Sarah Killion with a cross following a corner. Attempt blocked. Shea Groom (Sky Blue) right footed shot from the centre of the box is blocked. Assisted by Katie Johnson. Attempt missed. Shea Groom (Sky Blue) right footed shot from outside the box misses to the right. Assisted by Katie Johnson. Offside, Washington Spirit. Estelle Johnson tries a through ball, but Tori Huster is caught offside. Attempt saved. Shea Groom (Sky Blue) right footed shot from the centre of the box is saved in the bottom left corner. Attempt saved. Amanda Frisbie (Sky Blue) left footed shot from a difficult angle on the left is saved in the bottom left corner. Caprice Dydasco (Washington Spirit) is shown the yellow card. Substitution, Sky Blue. Amanda Frisbie replaces Madison Tiernan. Offside, Sky Blue. McKenzie Meehan tries a through ball, but Michaela Abam is caught offside. Attempt blocked. Whitney Church (Washington Spirit) left footed shot from the right side of the box is blocked. Assisted by Estefanía Banini. Penalty saved! Andi Sullivan (Washington Spirit) fails to capitalise on this great opportunity, right footed shot saved in the bottom right corner. 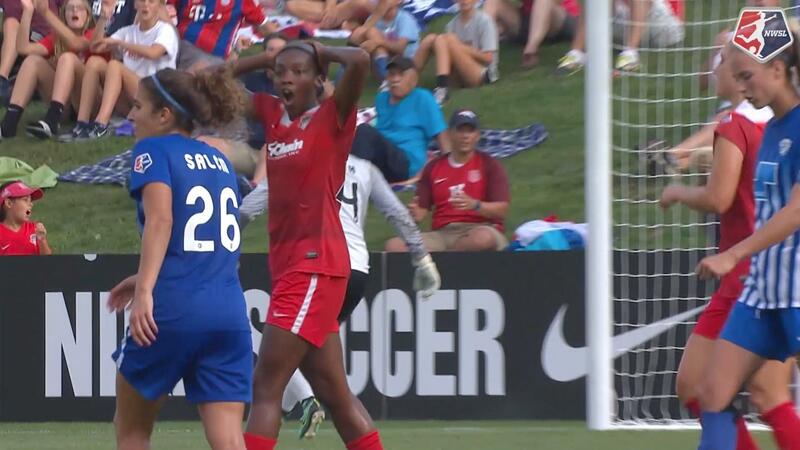 Penalty Washington Spirit. Estefanía Banini draws a foul in the penalty area. Foul by Michaela Abam (Sky Blue). Attempt blocked. Estefanía Banini (Washington Spirit) left footed shot from outside the box is blocked. Assisted by Caprice Dydasco. Attempt blocked. Meggie Dougherty Howard (Washington Spirit) left footed shot from outside the box is blocked. Assisted by Estefanía Banini. Attempt missed. Shea Groom (Sky Blue) right footed shot from a difficult angle on the left is close, but misses to the left. Assisted by Michaela Abam with a through ball. Corner, Washington Spirit. Conceded by Christina Gibbons. Attempt blocked. Tori Huster (Washington Spirit) header from the centre of the box is blocked. Assisted by Morgan Proffitt with a headed pass. Offside, Sky Blue. McKenzie Meehan tries a through ball, but Katie Johnson is caught offside. Offside, Sky Blue. Madison Tiernan tries a through ball, but Imani Dorsey is caught offside. Attempt blocked. Katie Johnson (Sky Blue) right footed shot from the left side of the box is blocked. Attempt blocked. Madison Tiernan (Sky Blue) left footed shot from the left side of the box is blocked. Assisted by McKenzie Meehan. Attempt missed. Joanna Lohman (Washington Spirit) with an attempt from the right side of the six yard box is close, but misses to the right following a corner. Attempt missed. Tori Huster (Washington Spirit) right footed shot from outside the box is close, but misses to the left. Assisted by Andi Sullivan. Attempt saved. Imani Dorsey (Sky Blue) right footed shot from outside the box is saved in the top left corner. Attempt saved. Shea Groom (Sky Blue) left footed shot from the centre of the box is saved in the bottom right corner. Assisted by Katie Johnson. Attempt missed. 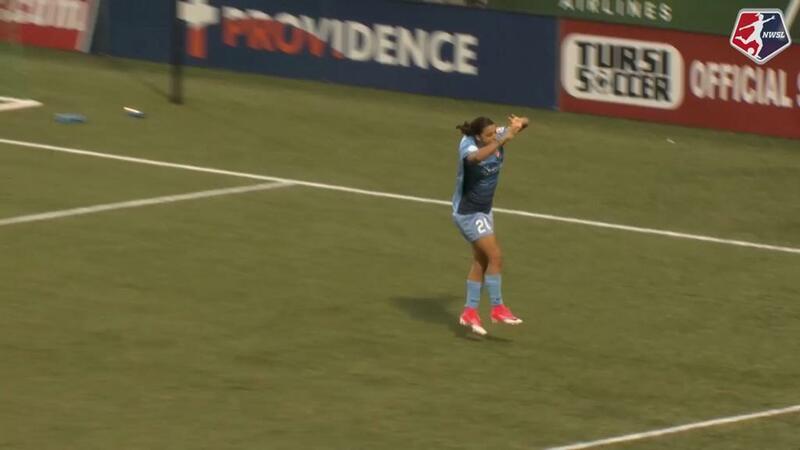 Katie Johnson (Sky Blue) right footed shot from outside the box is too high. Assisted by Madison Tiernan. Substitution, Washington Spirit. Joanna Lohman replaces Tiffany Weimer. Offside, Washington Spirit. Andi Sullivan tries a through ball, but Taylor Smith is caught offside. Attempt missed. Sarah Killion (Sky Blue) left footed shot from outside the box is too high. Assisted by Imani Dorsey. Offside, Washington Spirit. Tiffany Weimer tries a through ball, but Taylor Smith is caught offside. Attempt saved. Imani Dorsey (Sky Blue) header from outside the box is saved in the bottom left corner. Assisted by Dominique Richardson. Attempt saved. Madison Tiernan (Sky Blue) right footed shot from the left side of the box is saved in the bottom left corner. Assisted by Sarah Killion. Second Half begins Sky Blue 0, Washington Spirit 0. First Half ends, Sky Blue 0, Washington Spirit 0. Attempt saved. Katie Johnson (Sky Blue) right footed shot from very close range is saved in the centre of the goal. Attempt blocked. Madison Tiernan (Sky Blue) right footed shot from the centre of the box is blocked. Assisted by Christina Gibbons with a cross. Attempt missed. Dominique Richardson (Sky Blue) right footed shot from outside the box misses to the right following a set piece situation. McKenzie Meehan (Sky Blue) is shown the yellow card for a bad foul. Offside, Washington Spirit. Meggie Dougherty Howard tries a through ball, but Tiffany Weimer is caught offside. Attempt saved. Estefanía Banini (Washington Spirit) right footed shot from outside the box is saved in the top centre of the goal. Assisted by Tiffany Weimer. Attempt blocked. Madison Tiernan (Sky Blue) left footed shot from the right side of the box is blocked. Assisted by Katie Johnson with a headed pass. Attempt missed. Meggie Dougherty Howard (Washington Spirit) right footed shot from outside the box is close, but misses to the right. Assisted by Caprice Dydasco. Attempt saved. Whitney Church (Washington Spirit) header from the centre of the box is saved in the centre of the goal. Assisted by Morgan Proffitt with a headed pass. Morgan Proffitt (Washington Spirit) wins a free kick in the attacking half. Attempt missed. Estefanía Banini (Washington Spirit) right footed shot from the left side of the box is high and wide to the right. Assisted by Tori Huster.